School climate is making headlines – and peaking the interest of researchers and policymakers. So earlier this month, we caught up with Anastasia Raczek and asked her to explain what school climate is and how it relates to City Connects’ work. “School climate means lots of different things to different people. But we’re beginning to get more specific about it, and we do know a lot about what it seems to lead to,” Raczek said. As the Associate Director of Evaluation & Research, she helps lead an independent team that works to evaluate and improve City Connects. The team is based in the Center for Optimized Student Support, part of Boston College’s Lynch School of Education. 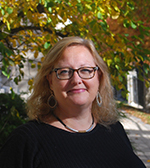 In December, Raczek spoke at an event on school climate that was organized by the Rennie Center and co-hosted by the Department of Elementary and Secondary Education, MassINC, Boston University, and Boston College. Conference participants discussed the connection between school climate and student success. A related policy brief is posted here. Here’s an edited version of the full conversation. Q: What is school climate? 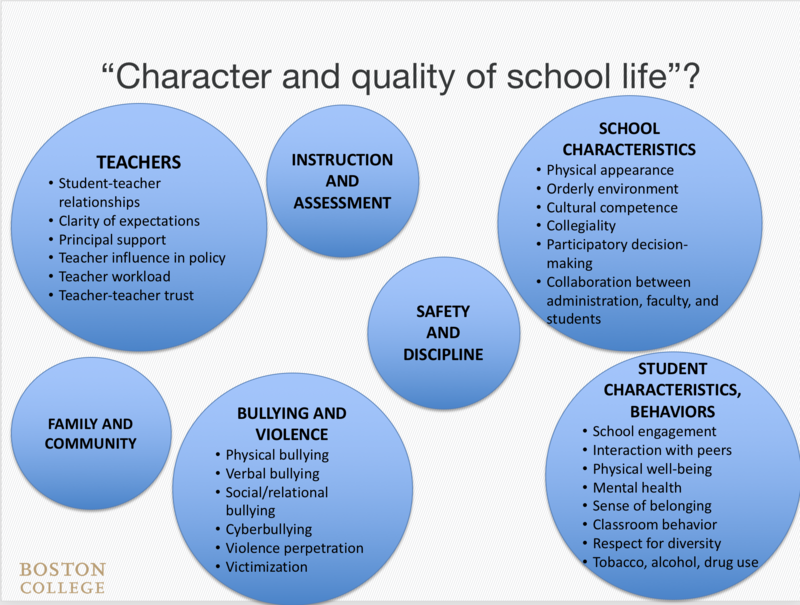 A: The National School Climate Center defines school climate as “the character and quality of school life” as key stakeholders – students, families, and school personnel — experience it. This includes school characteristics such as the physical and social environment, that is, whether it feels safe and supportive for all; interpersonal relationships, including respectful and caring teacher-student relationships, collaboration among faculty, and positive peer relationships among students; teaching and learning practices, including clear expectations for all; low levels of bullying and violence, with clear, fair disciplinary policies; and whether social and behavioral supports are available. Q: Why is school climate important? A: First, we know that children’s brains develop in response to the contexts they inhabit, at home and in school. Children who develop in a safe environment that’s responsive to their needs learn to better manage their own behavior and problem solve. There’s research that shows that they are less likely to bully other students or engage in other kinds of externalizing negative behavior. Also, when students feel safe, they are better able to learn. There is good evidence that improving school climate is related to improved academic achievement. 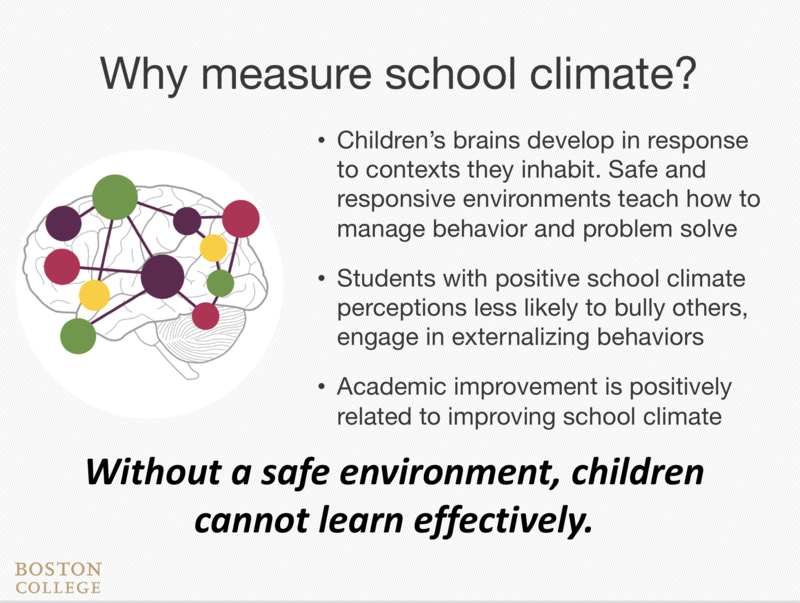 So, if you are able to go into a school and improve the environment to be more positive, you will likely see positive changes in academic achievement. Q: What’s the history of school climate? Since at least the 1950s, there has been interest in school environments. But probably the biggest leap happened starting in 1999 when three U.S. government departments — the Department of Education, the Department of Justice, and the Department of Health and Human Services — came together to develop an initiative called Safe Schools/Healthy Students that was aimed at community approaches to making schools safer and drug free. In 2010, the Department of Education developed the National Center on Safe Supportive Learning Environments, which was designed to provide technical assistance on school climate-related issues to states, school districts, and communities. Most recently, the Center produced a series of school climate surveys for students, school staff, and parents/guardians that can be administered via a web-based platform. Q: How did you become interested in City Connects’ impact on school climate? A: We started hearing feedback from principals and teachers on the surveys we administer annually about a positive impact of City Connects on school climate. About 95% of participating principals have said that City Connects is helpful in improving school climate. That was really interesting to us. Since that early finding, we have begun to learn more about what school climate means, how to measure it, and ways of trying to understand how City Connects may influence climate in a positive way. We are just beginning the process of studying this impact. Q: What kind of school climate data is available? A: In many of our parochial schools, we administer a survey to grade 3 to 5 students. This gives us information about student’s feelings about their teachers, their attitudes towards school, and their perceptions of competence and feelings in math and literacy. Students also rate their relationships with peers and report on problem behaviors that they might experience such as bullying – and in some cases they report when they are themselves doing some bullying. We have been tracking these data over time. Q: Is other data available? 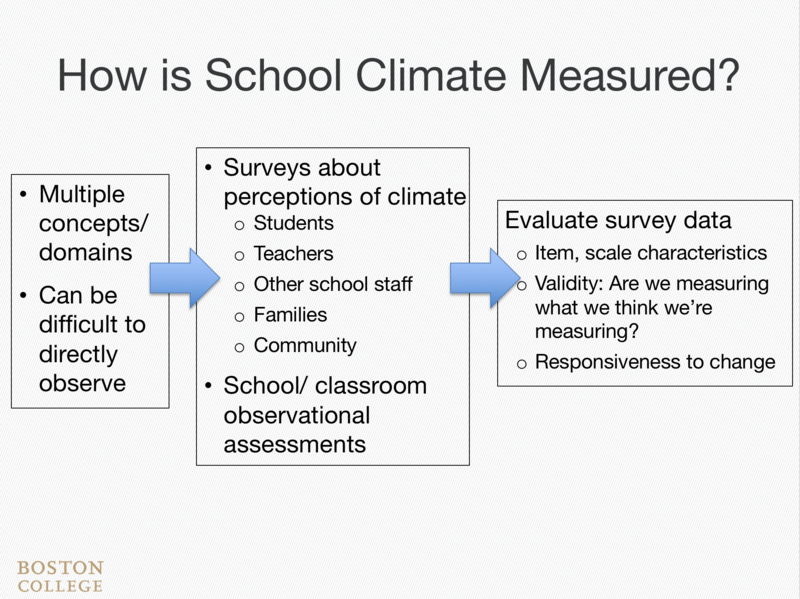 A: In recent years, some of the districts and states that City Connects is active in have begun to measure climate in a consistent way across their schools. For example, the Massachusetts Department of Elementary and Secondary Education has been piloting a statewide student survey related to school climate. That may give us an opportunity, should those data become available, to compare City Connects schools in Massachusetts with schools that haven’t experienced City Connects. We think it would be interesting to add these outcomes to our traditional work to learn more about any changes in school climate over time from before City Connects was introduced to after City Connects has been in place for one or more years. Q: As you develop ways to measure City Connects’ impact on school climate, what are the most important questions that you’ll be asking? A: What is the impact of City Connects on school climate, from the perspective of various participants? Do students and teachers feel like school climate is more positive? Do school leadership and the community experience positive changes in school climate? We’re interested in what specific facets of school climate City Connects seems to have an impact on. It could be student-teacher relationships or supporting a collaborative environment. It might be safety and discipline issues or changes in peer interactions. There are many different components, so it will be important to try and understand where City Connects makes a difference and for whom. A: School climate is directly related to how students do long term. So, if we truly are interested in providing the best educational experience for all students, we have to care about school climate. One of the things I ended the Rennie Center presentation with was describing what the school climate improvement process might be. It needs to be an intentional, collaborative, transparent process of the community working together to answer the question: What kind of school do we want? And that’s an intentional process. Who do you want to be, and how do we get there?